your data lost and / or erased by mistake. Recuva is a data recovery utility accidentally deleted. The simple and efficient data recovery utility, Recuva , adapts perfectly to beginner users. The application is able to restore any type of files: documents, photos, videos, music files, emails, etc. Recuva supports various types of storage: hard drives, external hard drives, memory sticks, memory cards, iPods, MP3 players, etc. In order to facilitate the use of the application, the Recuva wizard will help you to recover your deleted files. To do this simply answer a few questions and Recuva will do the rest. Select the type of files you are trying to recover (images, music, documents, video, compressed files, or mails). 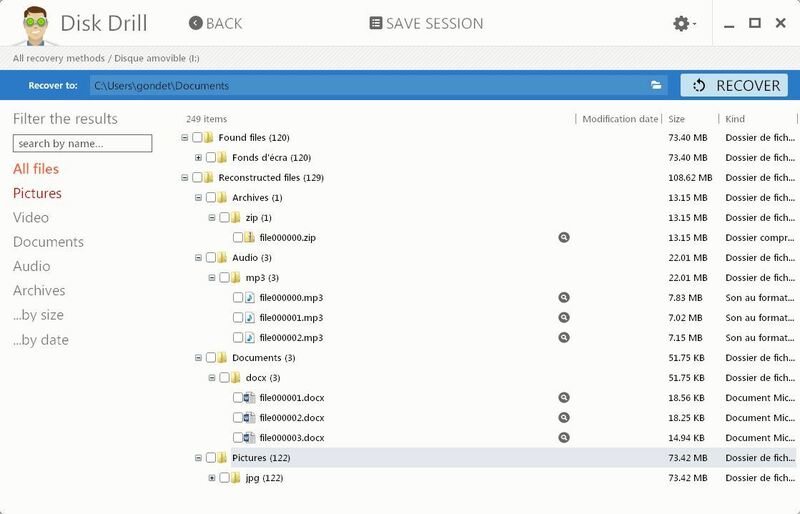 You can also view all recoverable file types. Then you will need to select the location of the file. Recuva can specifically search for erased files on all removable drives, user documents folders, or in the Recycle Bin. You can also search all over your computer. Once these steps have been completed, click the " Start " button to start the search. After completing the search, you will see a list of files found by Recuva . Simply select the files you want to recover and click the " Retrieve " button . If you do not want to use the " Recuva Recovery Wizard , simply press the " Cancel " key to use Recuva in its advanced mode for more experienced users. In case a previous scan failed in the file search, you can enable further scanning. Note that this may take several hours for large drives. Well known to Mac users, DiskDrill is now available on PC. This data recovery utility has a size advantage: a simple and intuitive interface, accessible to everyone. Detecting both internal disks and external storage devices (USB sticks, memory cards, and even iPod), DiskDrill has several recovery algorithms and performs a quick scan and thorough analysis if necessary until all Recoverable files are found. Once the scan is complete, all you have to do is select a backup directory and click on the "Recover" button to start recovering the files. PC Inspector File Recovery allows you to recover data when it has been lost. 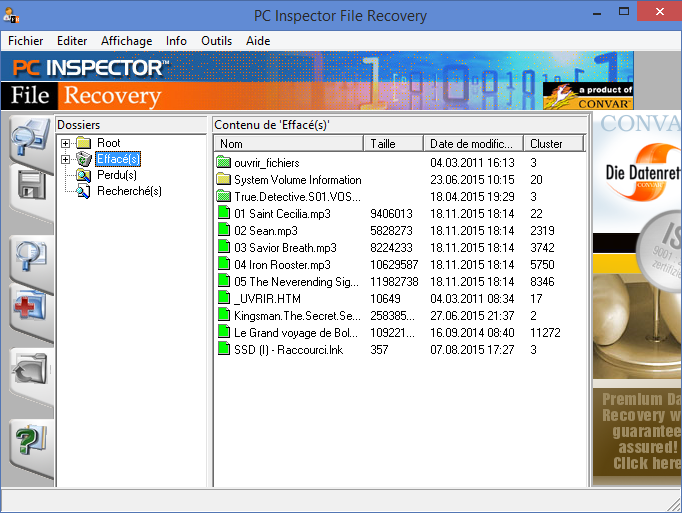 PC Inspector File Recovery retrieves your data on FAT 12/16/32 and NTFS file systems (hard drives, USB stick, etc.). It locates partitions automatically, even if the boot sector - Boot Sector - or the file allocation table is missing or damaged. It is capable of restoring a multitude of file formats - including DOC, AVI, EXE, GIF, HTML, LZH, MID, MOV, PDF, RTF, TAR, WAV, ZIP ... - with their original date and time. PC Inspector File Recovery offers three recoverymethods: search for erased files, recover lost files and finally, recover a disk. Note: it also allows you to save data to a network drive. UndeleteMyFiles will allow you to recover deleted files on your hard disks, USB sticks, SD cards, etc.Simple to use, a few clicks are enough . 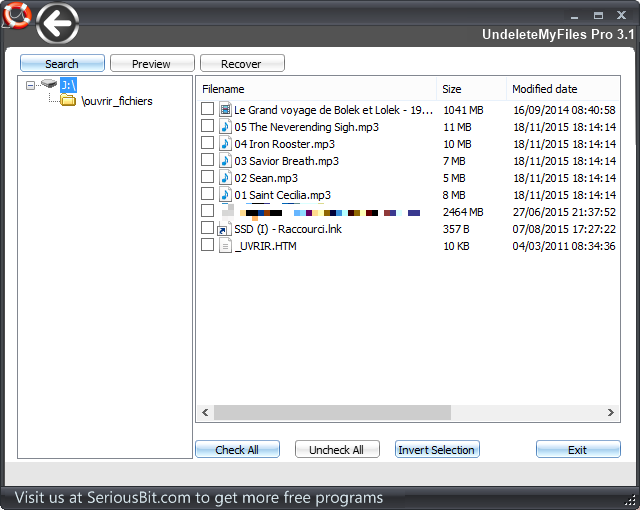 UndeleteMyFiles Pro is, despite its name, a completely free software. The program interface is sober, and after you click File Rescue and select the volume on which you want to retrieve the deleted data (hard drive, usb key, etc. ), UndeleteMyFiles Pro launches a quick scan. Once it is finished, a pop-up appears and tells you how many documents you can retrieve. To access it, just select the volume in the left column, then select the files you can recover by clicking Recover, and finally choose a destination directory. Simple and efficient. Pandora Recovery takes you by the hand from its launch. Indeed, before diving head down in the file recovery, the utility asks you a few questions via its assistant. You can find a list of detected devices (hard disks, USB sticks, memory cards, etc.) in a column on the left. After selecting the media on which to retrieve the missing data, Pandora Recovery will perform a fast scan of the recoverable data. Importantly, for compatible files such as images, they can be displayed in a preview at the bottom of the software window, simply by clicking on them. All you have to do is select all the documents you need and then click on the recovery icon represented by a garbage bin with a red arrow and then enter a backup directory so that your data reappears as magic. Puran File Recovery can perform an in-depth search to find all files that can still be recovered on a hard drive or external storage device (USB sticks, memory cards, etc.) in FAT12 / 16/32 And NTFS. Very simple to use, Puran File Recovery only asks you to select the storage media on which the files have been deleted, and then choose the type of search to perform. After performing a first quick scan, the tool displays the retrieved items found. It is quite possible to restart a more in-depth analysis by ticking the appropriate box to find more items. This type of search obviously takes longer than conventional analysis, but multiplies your chances of recovering your data. The list of retrieved files is displayed in the lower window of the program. It is also possible, by checking the box provided for this purpose, to display the files found with their native tree. 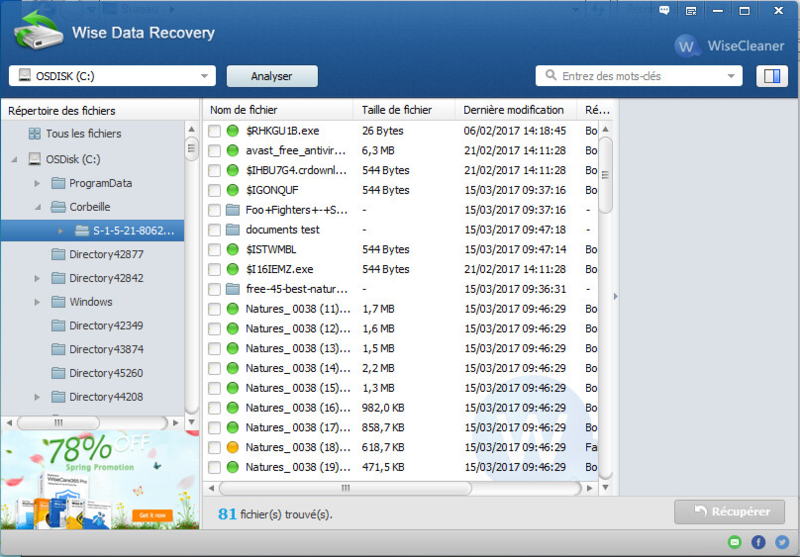 The recovery is then done very easily, by selecting the items to save and then clicking the Retrieve button. Supporting many filesystems (NTFS, FAT, EFS, etc.) 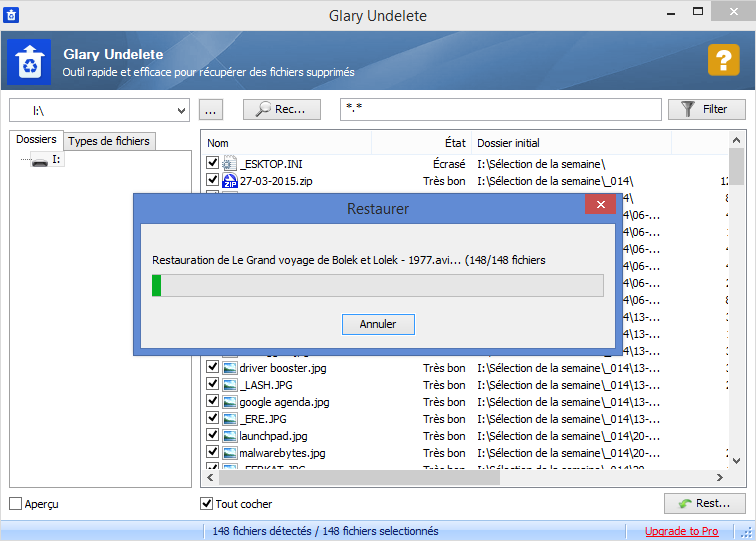 Glary Undelete is capable of recovering data even if it has been compressed or encrypted, both on the internal hard disk of your PC and on the USB keys, External hard drives or memory cards. Its operation is within reach of all since it is enough to indicate to him the storage device on which you want to recover files to launch an analysis. 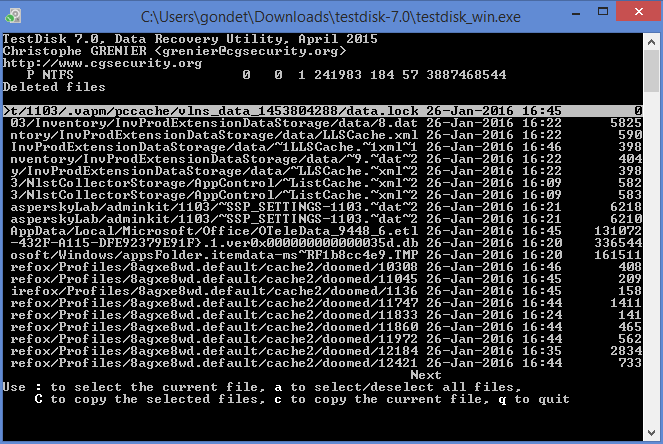 The search by Glary Undelete displays in real time the number of potentially recoverable files detected. At the end of the search process, all items found by the software are displayed within a list in the main program pane. It is possible to filter the results to make it easier to find a particular file or file type. The utility then asks you only to select the items to recover and then click on the "restore" button to initiate the repatriation of the lost data. Who is better positioned than a storage device manufacturer to offer a data recovery tool? Transcend makes it a perfect demonstration with its RecoveRXutility , an easy-to-use recovery software designed primarily for the general public. Compatible with both hard drives and SSDs, memory cards and other USB sticks, RecoveRX is capable of recovering all types of file formats: images, videos, documents, etc. Its main asset lies in an intuitive interface incorporating a true recovery assistant that guides you through the various stages of the process. Indeed, from the opening, RecoveRX displays the list of detected devices on which it is able to search for deleted files. The next step is to select which file extensions to look for first for each file type. 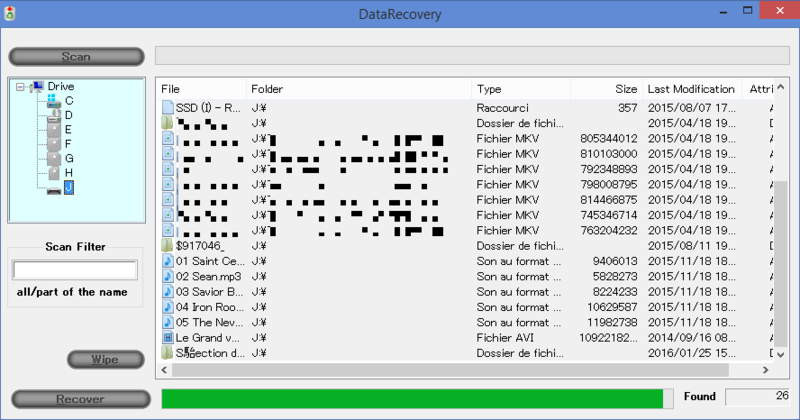 All items retrieved by RecoveRX are automatically saved to the root of your PC's system disk in a directory called Recovered Files. However, remember to choose a directory or backup device that is different from the system disk to avoid rewriting it on the system disk and take the risk of erasing your chances of recovering deleted files. All items retrieved by RecoveRX are automatically saved to the root of your PC's system disk in a directory called Recovered Files. However, remember to choose a directory or backup device that is different from the system disk to avoid rewriting it on the system disk and take the risk of erasing your chances of recovering deleted files. All items retrieved by RecoveRX are automatically saved to the root of the system disk of your PC in a directory called Recovered Files. However, remember to choose a directory or backup device that is different from the system disk to avoid rewriting it on the system disk and take the risk of erasing your chances of recovering deleted files. Whether it's a simple USB stick or an external hard drive, Tokiwa DataRecovery is able to analyze the contents of all the storage media connected to your machine, including system disk. Main advantage of this program, it does not require any installation and can be opened from a USB key dedicated to this use. Tokiwa DataRecovery provides instant access to the disks it detects and is responsible for searching deeply for all the deleted files by allowing you to set a filter to restrict, for example, searching to a specific file type. The recovery of the files is also very simple since it is enough to highlight the elements to be found, to click on the "Recover" button, And then specify the directory where the retrieved data will be stored. 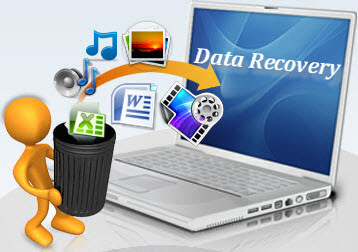 The Wise Data Recovery Recovery utility is capable of recovering data on both the hard disk of your PC and external storage devices such as USB flash drives, memory cards and other external hard drives. Very easy to use thanks to its perfectly intuitive interface, Wise Data Recovery operates on any type of file. This allows you to retrieve your documents, photos, videos very easily after launching the media analysis. To ensure that data recovery is successful, Wise Data Recovery requires that you use another storage media to recover deleted data to ensure that no data can be written to the media Which would lead to the final loss of compromised files. Note that if Wise Data Recoveryallows you to recover your deleted files individually, it is also able to find complete directories. Frequently you can forget the password of the Wi-Fi connection of the house when you want to connect a mobile device such as a smartphone, a tablet or a portable console. If it is possible to find the Wi-Fi login password on Windows, the manipulation to get there is far from intuitive. It is necessary to enter several parameters of the connection parameters before finally finding the password and to be able to display it in clear on the screen. To prevent this, there are some utilities that take care of recovering the login password for you very quickly. This is what the WiFi Password Revealer utility, for example, offers . Once opened, The program will find all the Wi-Fi (WEP / WPA) passwords that you could have entered and saved on your machine. WiFi Password Revealer even allows you to directly copy a selected password to paste it directly into the login window, convenient if you are accustomed to imagining extended passwords, however, security features for your connection. Alternatively, you can find the password for your Wi-Fi connection : WirelessKeyView . This free utility works in the same way as Wi-Fi PassWord Revealer. WirelessKeyView will also plot directly into your computer's meanders to retrieve the history of Wi-Fi passwords stored in your PC's connection settings. 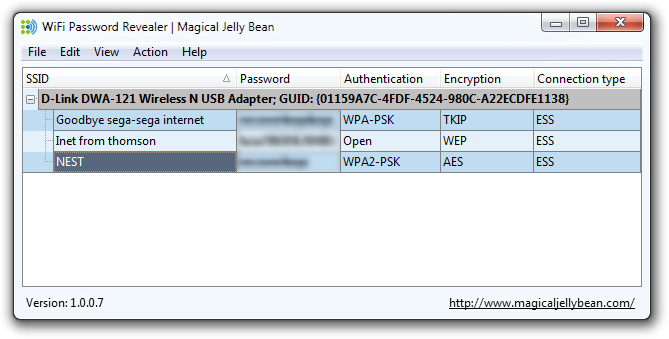 Its use is also childish since WirelessKeyView directly displays all logins and login passwords stored on your machine. You just have to copy the required password to paste it directly into your login window. If you want to keep a physical copy of your Wi-Fi passwords, WirelessKeyView offers to export them to a text file that you can then print. Be careful, however, to securely store sensitive data to avoid any unpleasant surprises. RecAll is software that specializes in recovering passwords and software serial numbers. Here again the program takes you by the hand by proposing an assistant who takes care of everything, or almost. Your computer is fully scanned and all recoverable items appear in a list with the application name, login ID of the recovered account and password, and, in the case of software, registration keys that You will be able to install them and activate them again on your workstation. Once all the data is found, recAll offers to export them to a file (text, html, csv, etc.) that you can consult later. This online service offers users of Google tools the ability to back up their personal data. 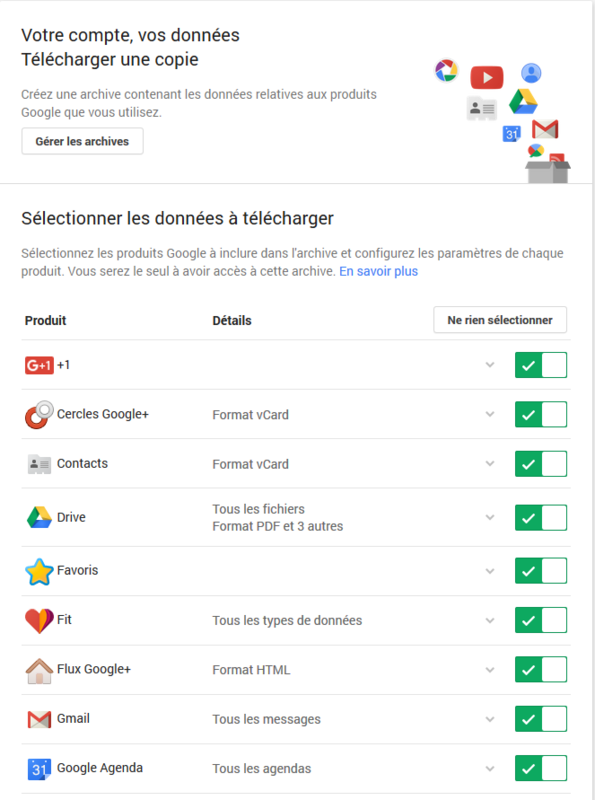 Google Takeout generates a backup copy of the data you want to keep from the following products: Google +1, Google+ Circles, Contacts, Drive, Favorites, Fit, Google+ Feed, Google Voice, Profile or Youtube. When the archive is ready to be downloaded Google Takeout sends you an e-mail notification. A bad handling and this is the drama, you just accidentally delete an entire partition from your hard drive. 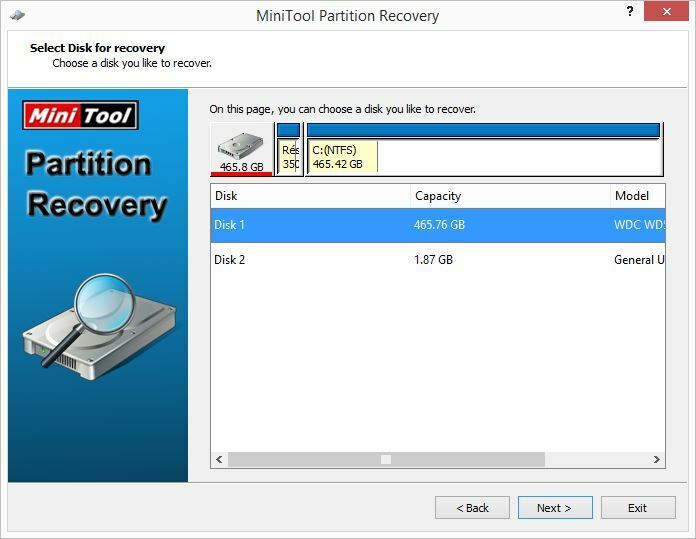 However, you can easily recover it using MiniTool Partition Recovery . This utility specializes in recovering deleted, damaged or inaccessible partitions, allowing you, in a few clicks, to go back and find your precious data. Simply follow the steps provided by the software wizard to quickly find the missing partitions. When the previous software could not get results for different reasons, TestDisk will be able to. But for that you will have to be patient and technical. The Advanced Data Recovery Utility, TestDisk is intended primarily for advanced users and experts. The application polls your BIOS or operating system to detect hard drives and their characteristics (LBA size and CHS geometry). TestDisk performs a quick check of the disk structure to detect errors in the Partition Table. If the Partitions Table contains errors, TestDisk can repair them. The Application retrieves data from lost partitions or repairs the file system of a hard drive, USB flash drive, memory card, etc. TestDisk runs in a "Ms-Dos" window. When launching the application, choose "Create" to create a "log" file containing various technical information and results produced by TestDisk . Select the partition where the disk is located with the lost data. Choose the partition table type, normally the default value is correct because TestDisk has performed an auto-detection. Select "Advanced" to access the Data Recovery utility. Choose your disc and the submenu "Undelete" To view the recently deleted data. Finally, select the files you want to recover. In order to improve the chances of recovery, it is advisable to recover the files on another partition (USB key, removable card, second disk, etc.). Another possibility that is offered to you, Gparted . 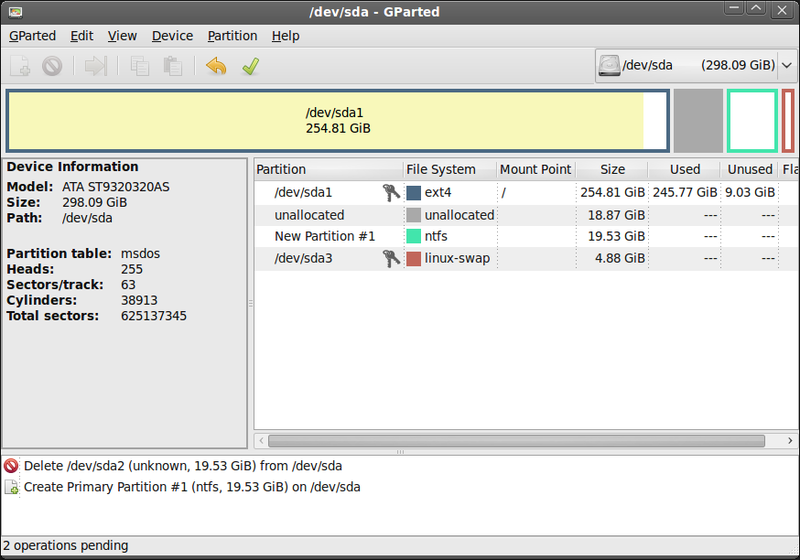 The program, better known to Linux users to manage partitions on a hard drive, is also able to recover lost partitions. And it's via the Live version, including a bootable version from a CD or USB stick, that you can use Gparted Live to recover an accidentally deleted partition or repair a damaged partition. All you need to do is to create the bootable CD or USB key using the corresponding ISO disk image and then start your computer on it. Gparted Live then runs in its own environment and allows you to view your partition tables to manipulate them. 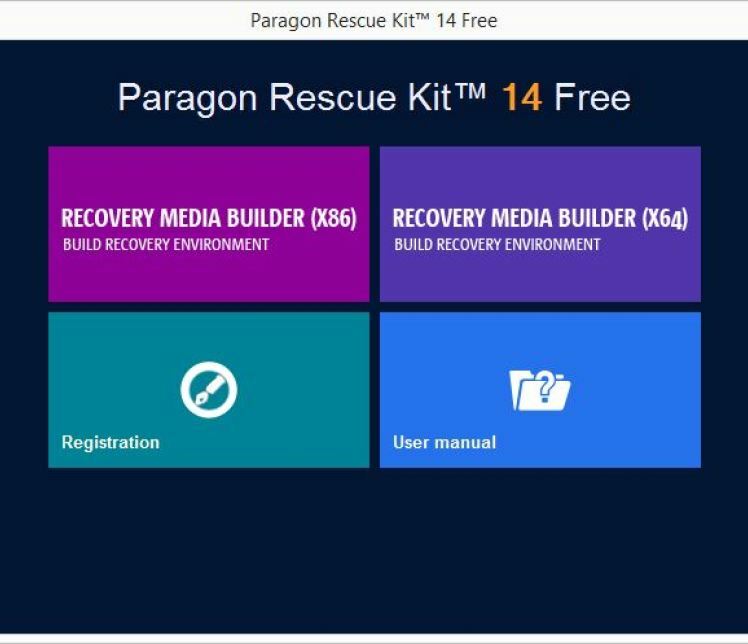 Paragon Rescue Kit Free allows you to restore a PC that can not boot. The tool creates a bootable CD or USB key with which you can start your PC and access its data to save it. It can be used free of charge, however it requires a registration on the website of its publisher, Paragon, which will send you a registration key by mail to activate the software. After the recalcitrant computer starts up with the Paragon Rescue Kit CD or USB key , you can back up your disk data, restore a disk, partition, or just a few files, transfer files to external storage media, correct Booting the system, Edit the registry, or clean Windows user passwords by removing any user and administrator passwords. The Undeleter Recover Files & Data mobile app specializes in data recovery on Android. To work, it requires a rooted Android smartphone, but allows you to find documents accidentally deleted from your smartphone. To do this, the app performs a scan of the directory you have specified to it (on the internal memory or the microSD card) and displays a list of deleted items that can be retrieved. Note that in its free version, Undeleter Recover Files & Data only allows you to recover only image files. You can then choose to back up the files found on the phone memory, or simply upload them to Google Drive and Dropbox. Another convincing solution to recover data on an Android smartphone or iPhone: MoboMarket . This program is designed to manage files and documents stored on your devices, but also has a very interesting toolkit. It allows to retrieve data stored on smartphones to save them on your PC, with a view to transfer them later to a new device. MoboMarket's Toolbox allows you to create backups of many files: contacts, SMS, call log, photos, application, and even music, a very practical option especially for iPhone owners who would like to transfer stored music On their phone to their computer. 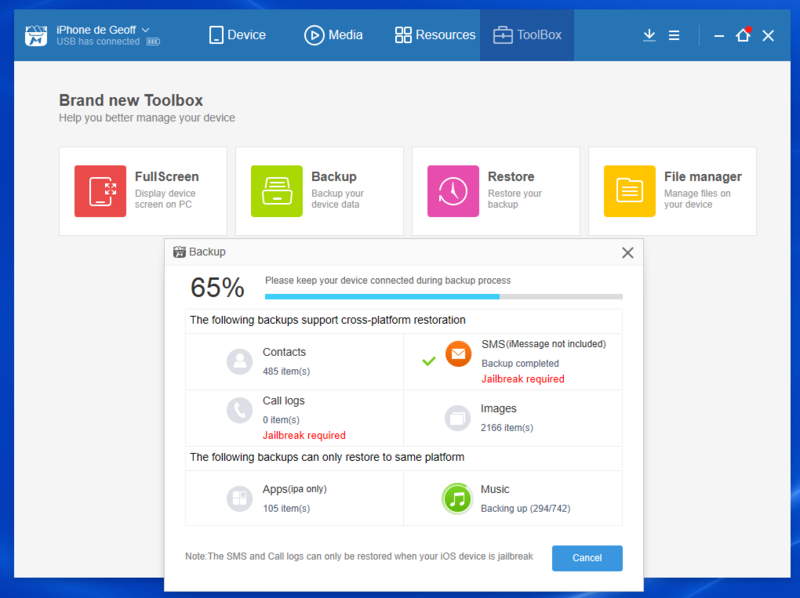 To do this, Select the type of items to be backed up, MoboMarket will create a complete backup of this data and store it in a dedicated directory. Never immune to tampering, you may unintentionally remove valuable photos stored on your smartphone or tablet. Rest assured, nothing is permanently lost. DiskDigger photo recovery offers you to recover your erased photos by mistake in very quick steps. 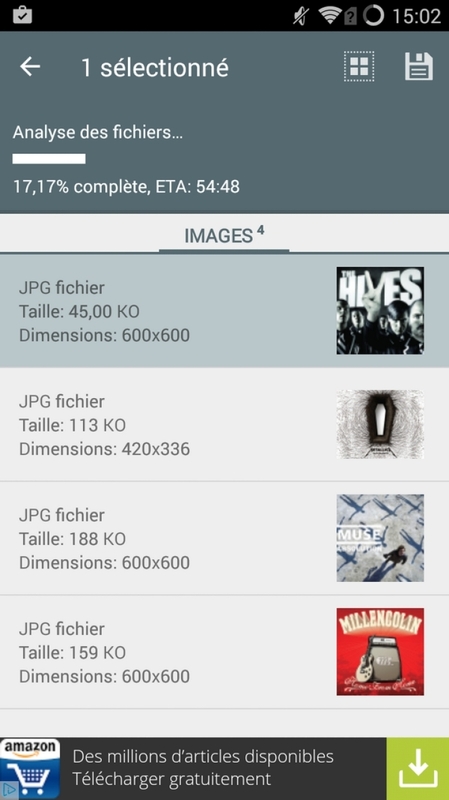 Running without the need to root your device, DiskDigger photo recoveryoffers to analyze the contents of your smartphone and then displays all the deleted files that it detected and that it is possible to recover. To find your images, simply select the items to recover and then tell DiskDigger photo recovery where you want to retrieve the data.